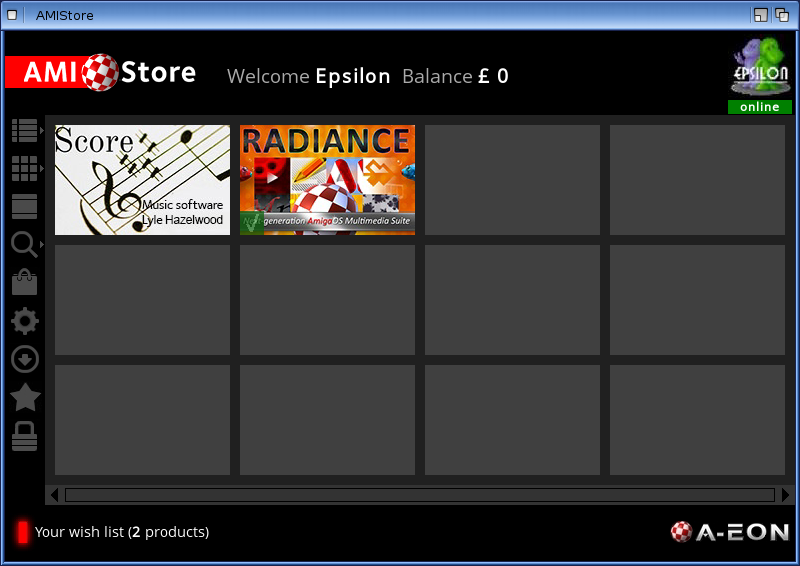 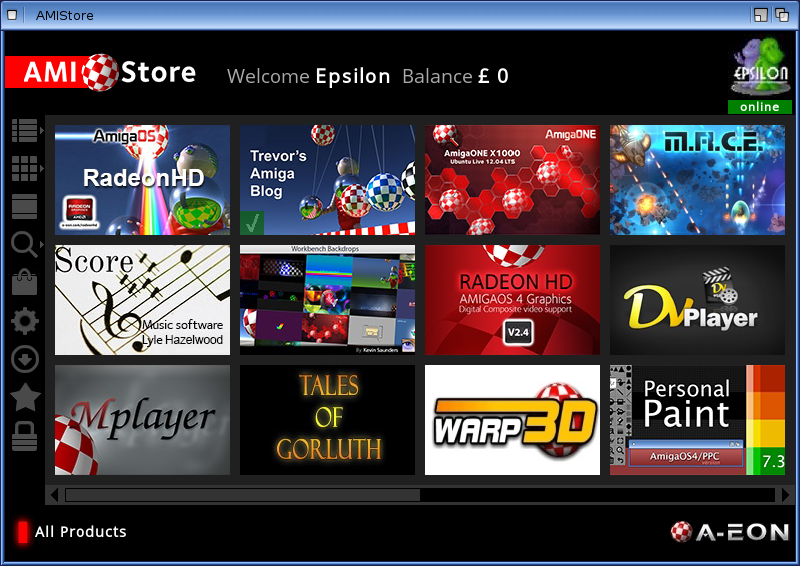 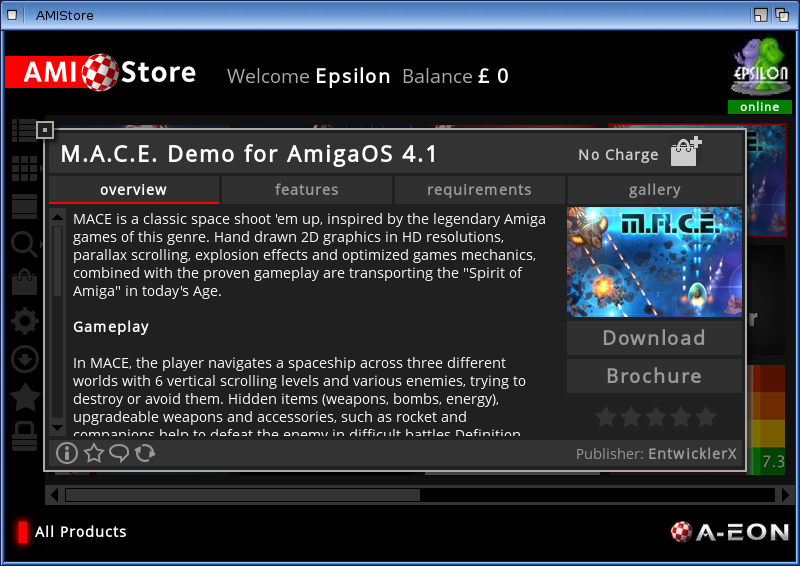 Today I have for you a Sneak Peak at the upcoming AMIStore app store for AmigaOS4.1 on my X1000, kindly provided to me to try out by A-EON Technology. 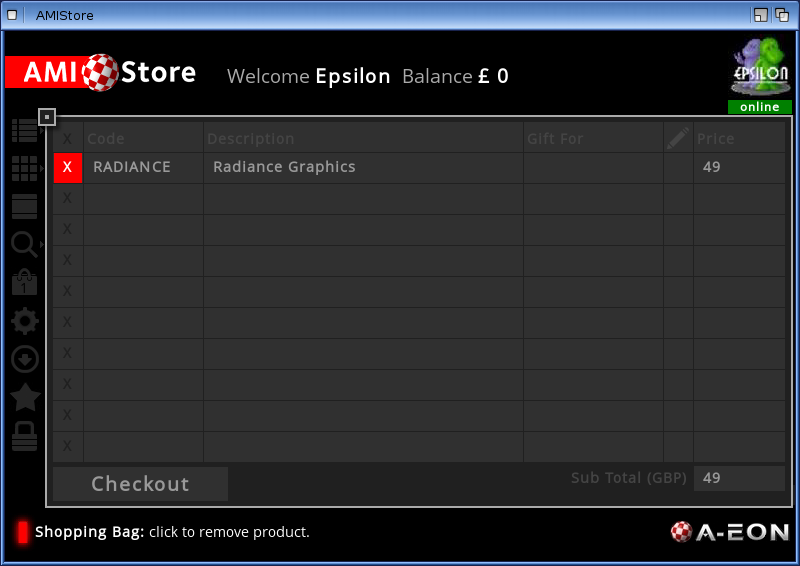 Let's Dive In! 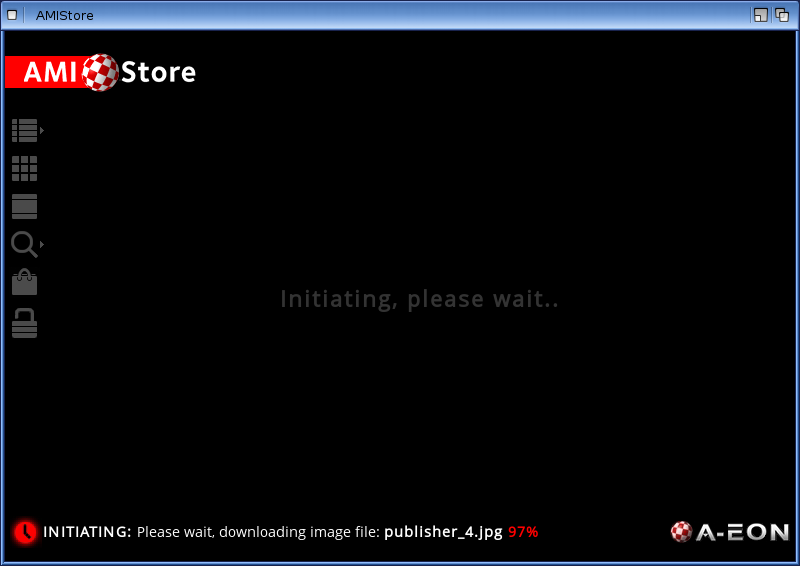 I was given the Install_AMIStore program, which kicks things off. 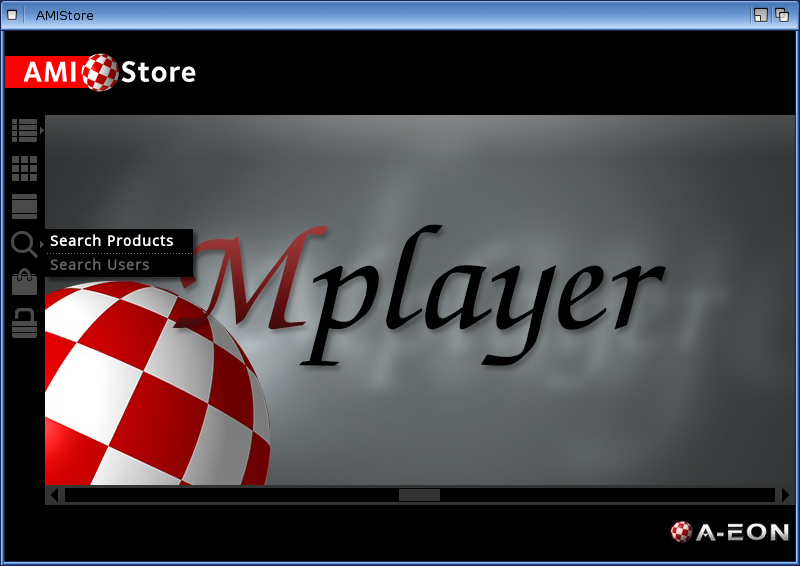 When released it should be available to download directly from www.amistore.net. 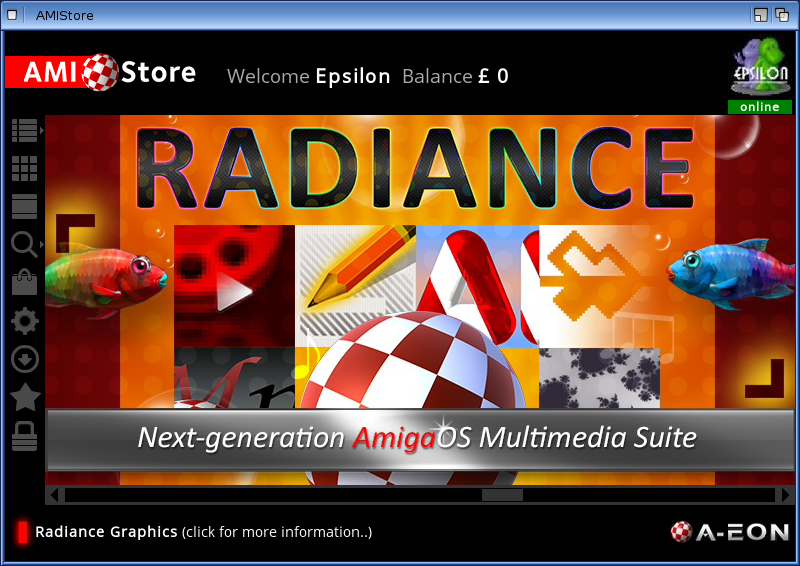 Simply run this program once downloaded. 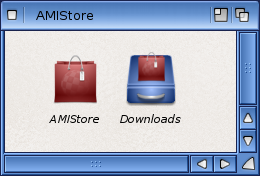 Here is the AMIStore drawer. 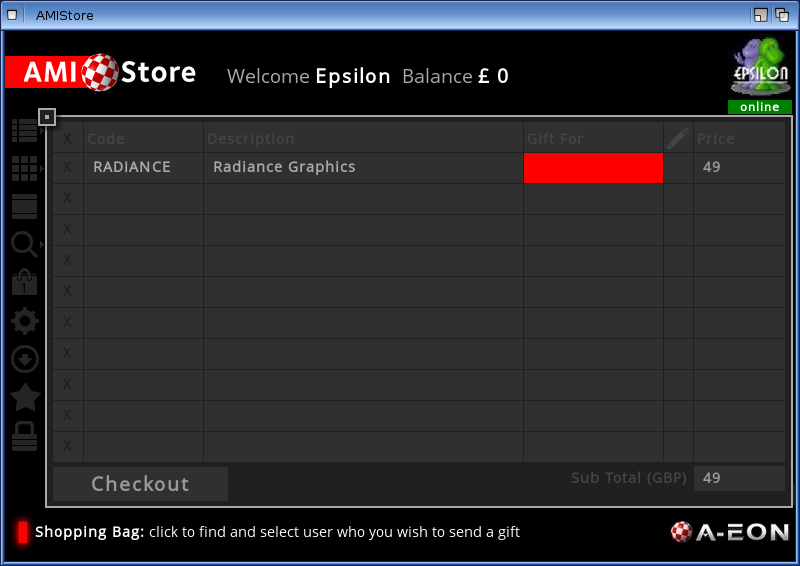 There is also Shopping Bag, AMIStore Preferences (when logged in), Show my purchases and downloads (when logged in), My product wish list (when logged in), and AMIStore login/logout to complete the navigation bar on the left. 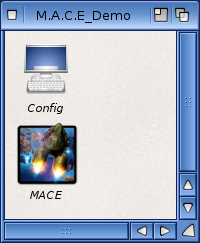 At the moment I am not logged in so a few icons are missing. 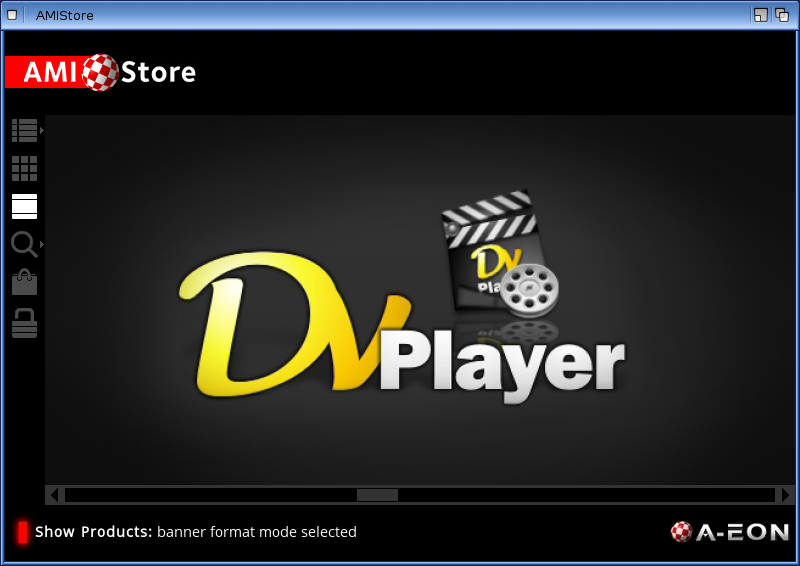 You can add this product to your wish list by clicking the Star icon in the bottom, the i button shows the version number, the comment icon to add comments, reload the application data from the server completes the icons at the bottom. 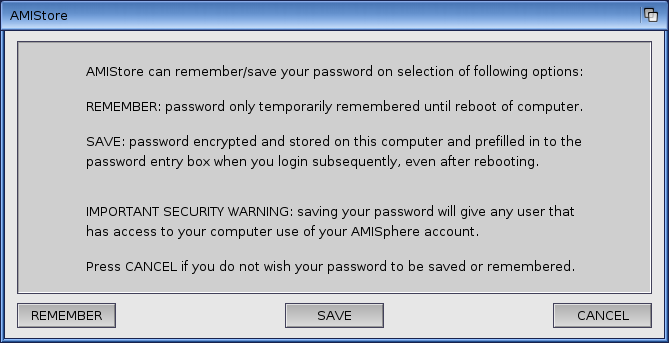 If you click on Download it will immediately ask you to login with your AMISphere account (since I hadn't logged in yet). 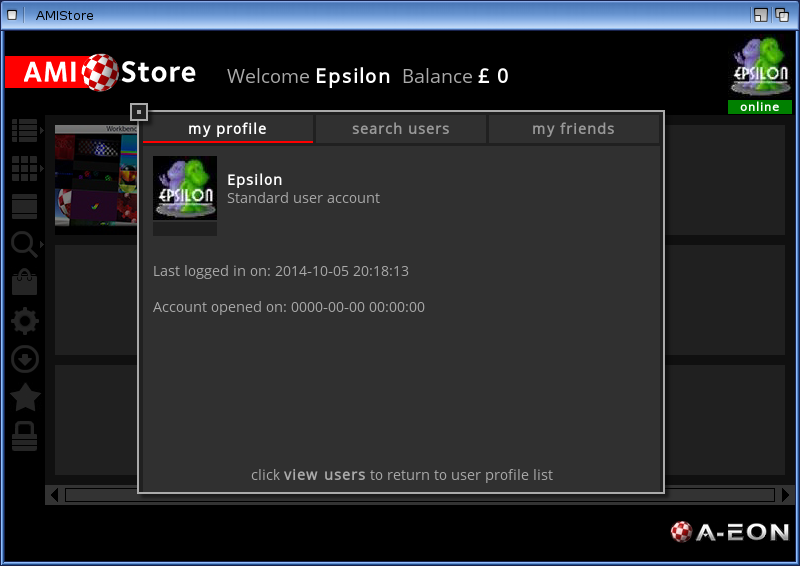 This AMISphere account is the same account registered X1000 owners use to download registered updates from A-eon's website. You can click on the GBP to change it to USD or EUR currency automatically. 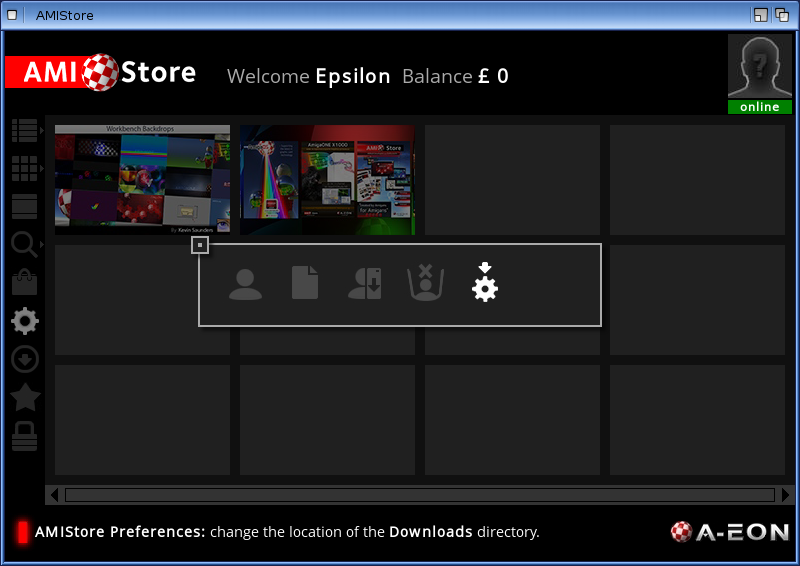 Of course, being able to change your avatar image in the AMIStore preferences also is great (jpeg format), and I wasted no time doing that! 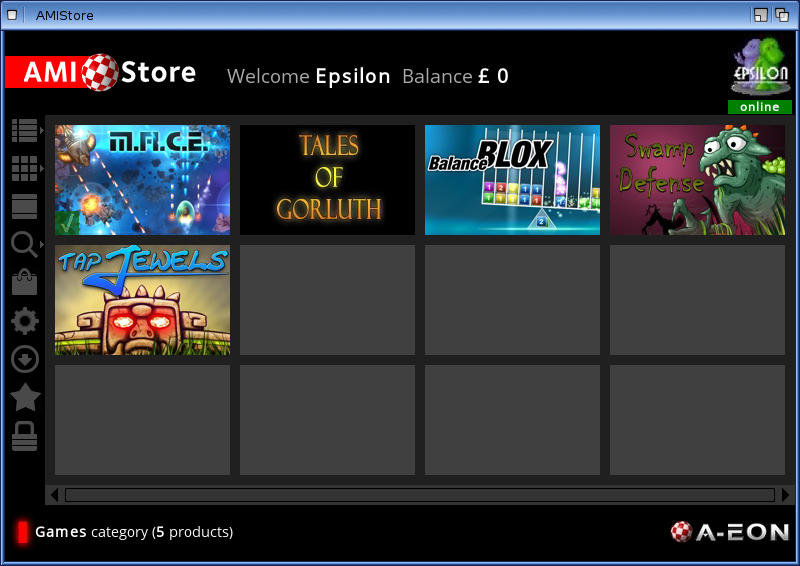 At any time you can use the Show my purchases and downloads to see your previously purchased items, and click on them to redownload them again. 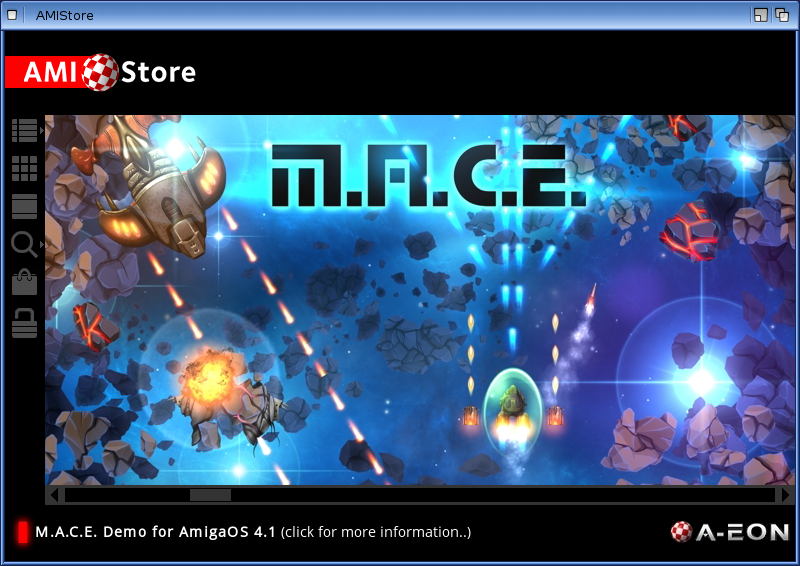 But now to try a game - so I choose to try the M.A.C.E Demo - I already bought M.A.C.E previously direct from AmiBoing, but I wanted to show the process. 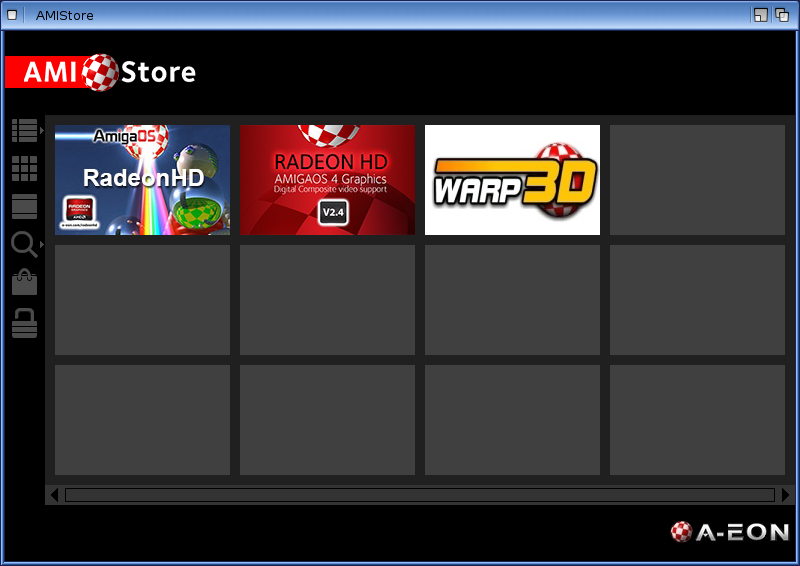 When you close AMIStore it logs you out and closes down. 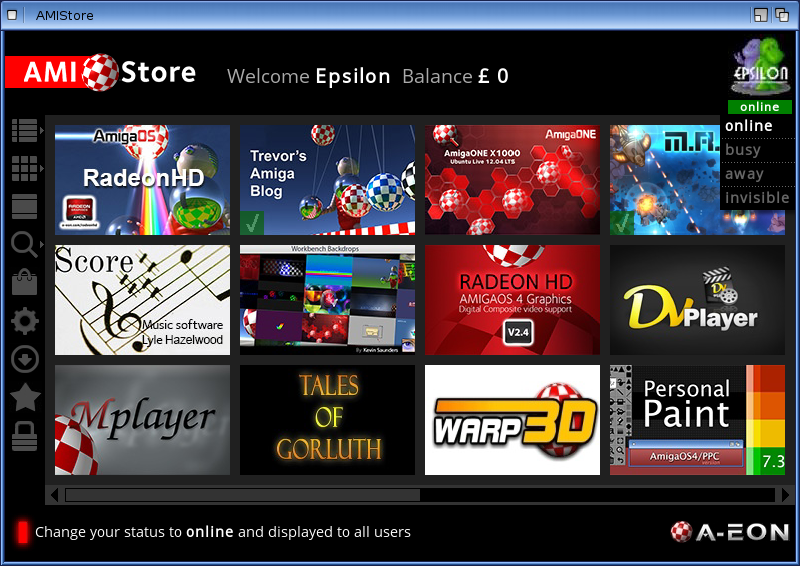 That concludes my sneak peak of AMIStore - expect to see and hear plenty more about it very shortly! 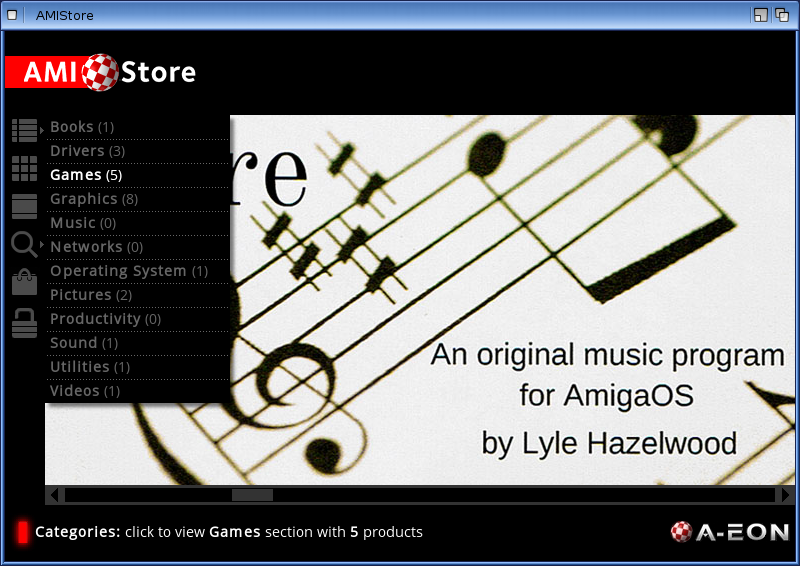 My initial feedback of using AMIStore is very positive - it is easy to navigate with lots of features. 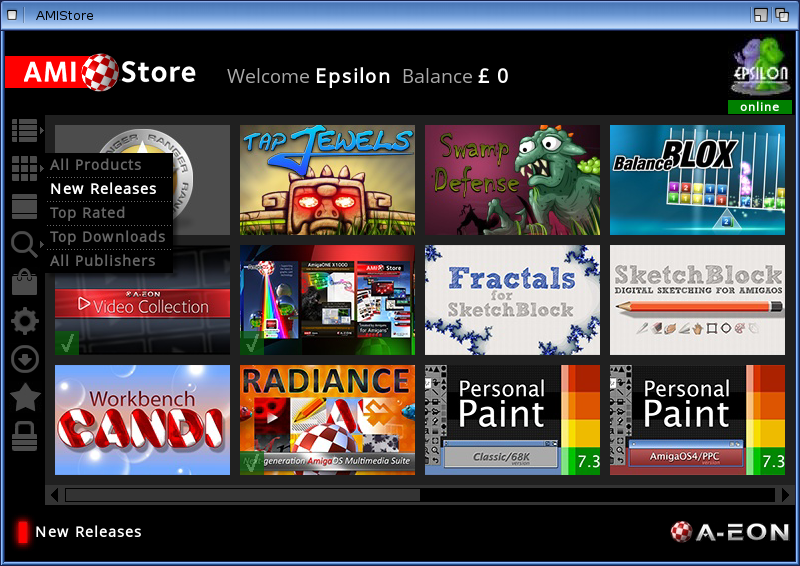 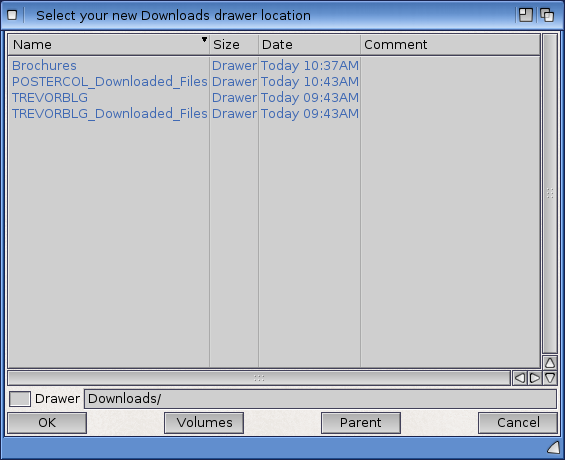 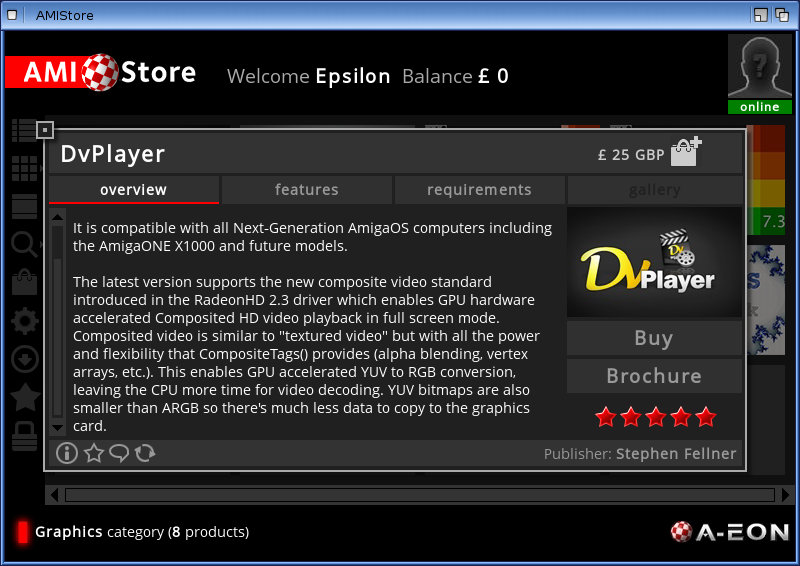 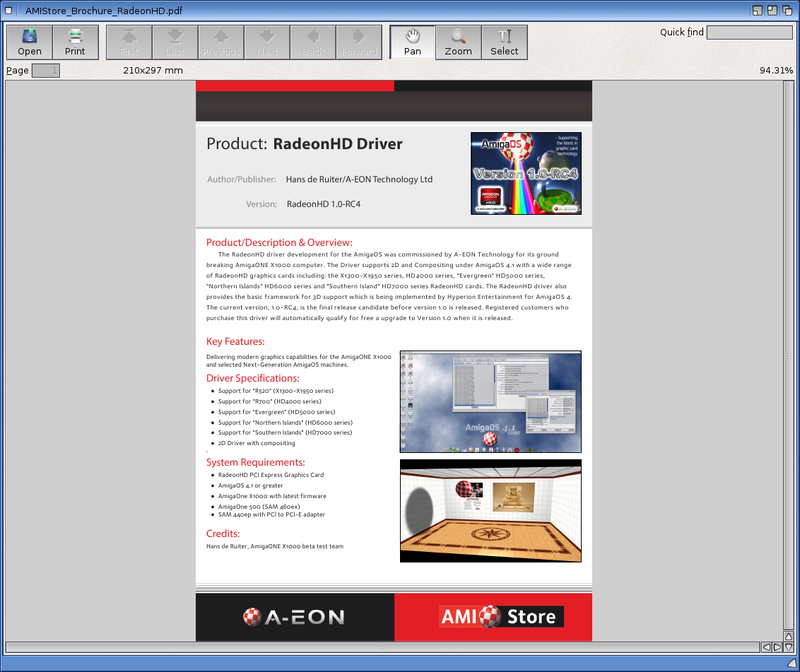 It is clear they have gone to a great amount of trouble to write this software over the past year or so, to create something user friendly, easy to view, preview, purchase and download/install software, while making it easier for AmigaOS4 developers to get their applications noticed and hopefully more widely purchased. 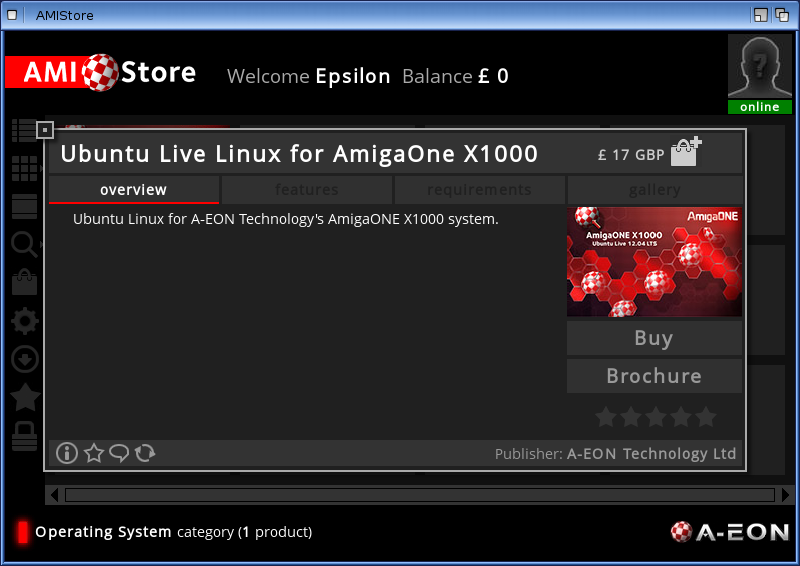 I know A-EON Technology have many more features planned for AMIStore in the future too. 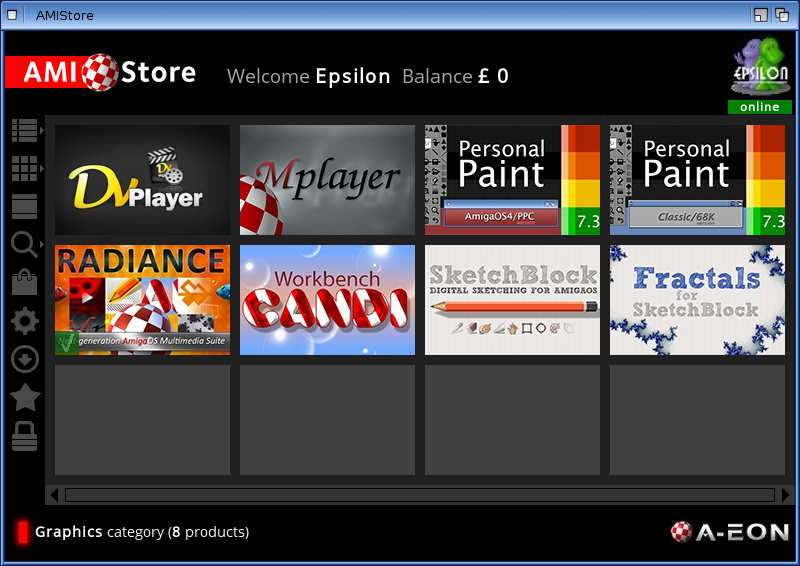 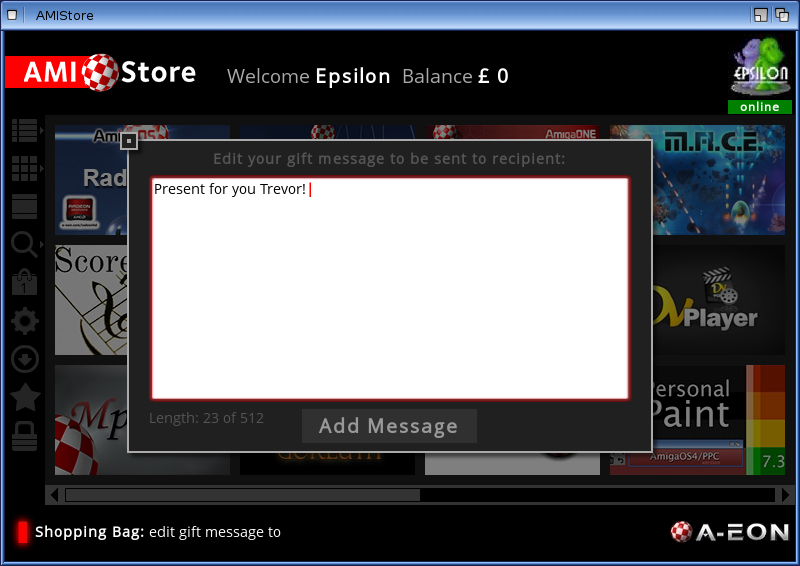 So expect more functionality and plenty more applications in the AMIStore as time goes on! 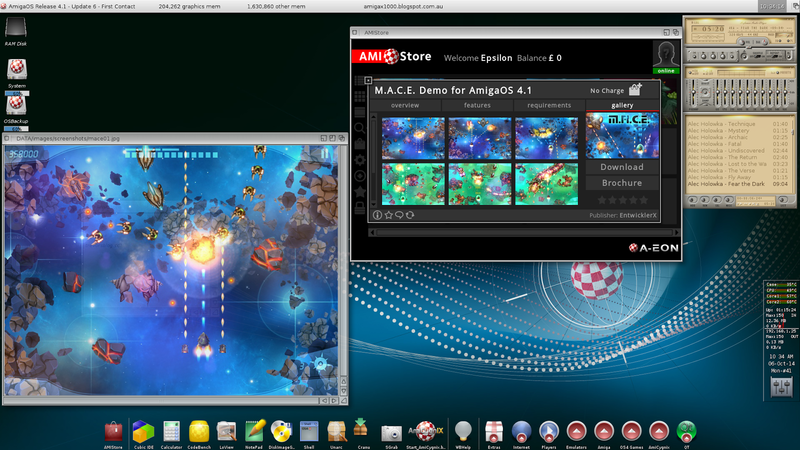 I hope the AmigaOS4 user and developer community embraces AMIStore - like the Apple App Store, Google Play Store, etc, this model of software distribution is the popular way these days to purchase and deploy applications globally. 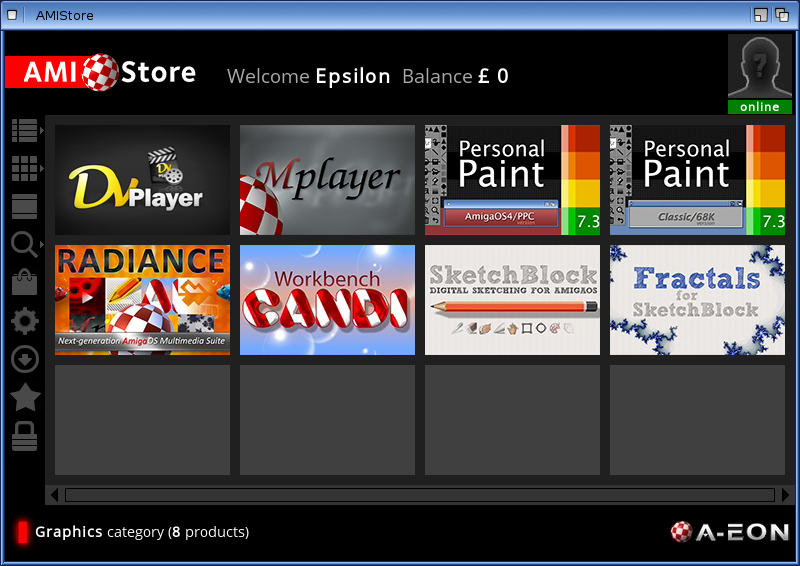 It is great to finally have this kind of App Store on the X1000! 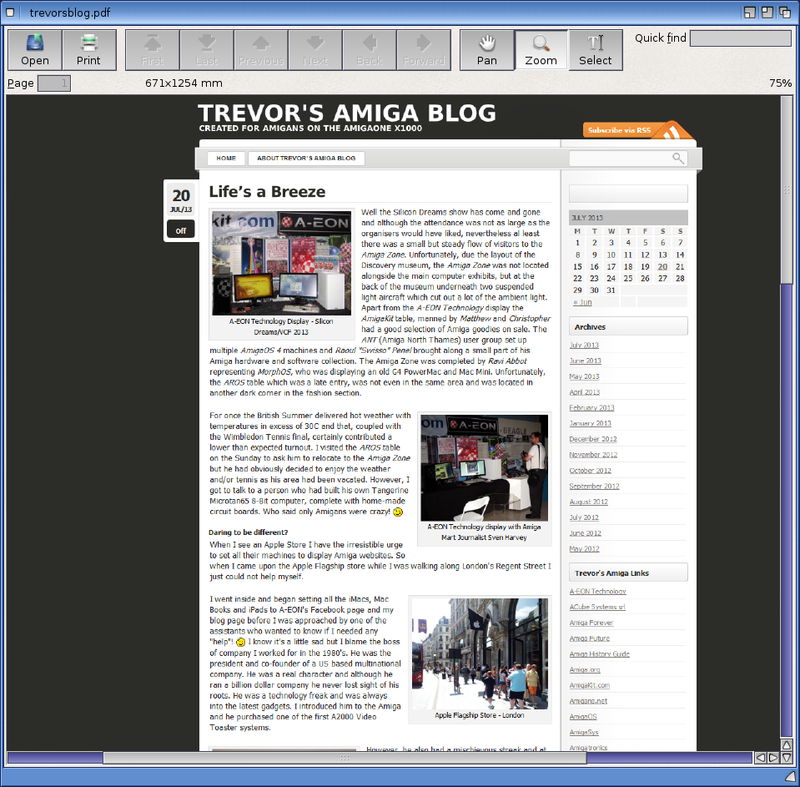 Great review....a couple of questions though....is Amistore only for X1000 users? 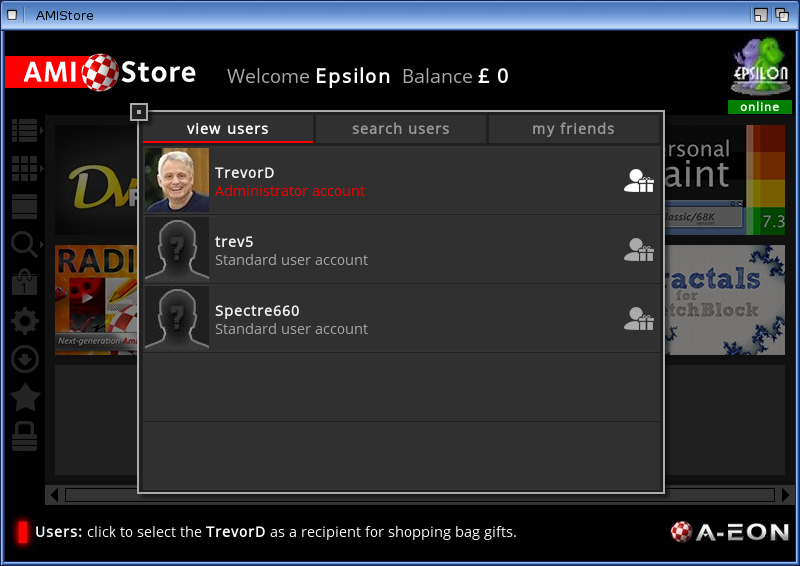 And, if you are NOT an AEON registered user, how do you get a login / password?